The Smithsonian National Zoo spruces itself up every year with ZooLights, celebrating the holidays and the Zoo’s animals throughout the park and staying open late to allow visitors to enjoy the lights along with live music performances, tasty winter treats, and plenty of opportunities for holiday shopping. 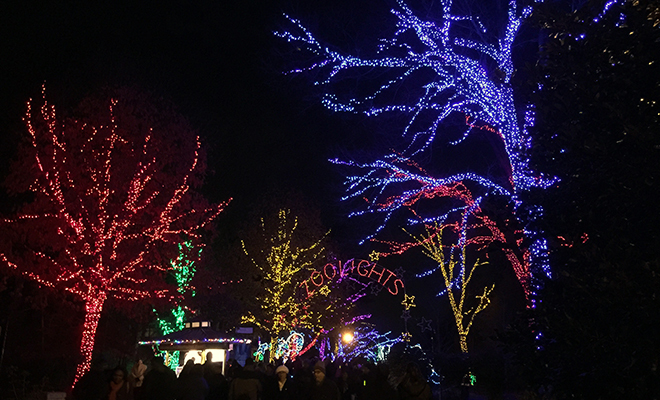 This year, the Friends of the National Zoo (FONZ) group is hosting special nights including BrewLights on December 1 and Date Night on December 8. BrewLights is a ticketed microbrew and craft beer event. Guests can enjoy beer tastings from a dozen breweries and sample savory foods from top local restaurants, all under the bright lights of Washington, D.C.’s favorite holiday tradition. All proceeds support the critical work of the Smithsonian’s National Zoo and Conservation Biology Institute—including species preservation and animal care. Tickets are $45 for members and $55 for non-members in advance ($55 and $65 respectively at the gate). Tickets include 6 pours of beer (additional full pours may be purchased), food tastings, souvenir light-up cup, and complimentary snow-tubing rides. ZooLights amps up the romance for couples on Date Night, featuring an exclusive giveaway and holiday carolers at the Great Meadow. You and your boo will also enjoy champagne cocktails, hot toddies, and sweet treats, along with a spin on the carousel and snow-less tubing. Tickest are $50 per couple for members and $65 per couple for non-members. Tickets include two champagne cocktails, two hot toddies, two snow-less tube ride tickets, two carousel ride tickets, and one sweet treat per couple. ZooLights runs through January 1, 5-9 p.m. nightly (except Dec 24 & 25) and is free entrance. ← Previous Story 5 Underrated Things to Do at Night in Washington D.C.